Less than seven months after suffering a severe spinal cord injury while playing in a high school hockey game, Jack Jablonski continues to inspire people across the sport. The injury left the 16-year-old paralyzed, but his determination and dedication to rehab since then has been noticed by the National Hockey League. It all came together Thursday night at the BEL13VE in Miracles Gala, a private fundraiser held at the Xcel Energy Center by the Minnesota Wild that raised more than $120,000. The money was raised through ticket sales and a private auction at the event, which drew almost 1,000 guests and volunteers, including Jeremy Roenick and Lou Nanne as well as the Wild's newest stars, Zach Parise and Ryan Suter. 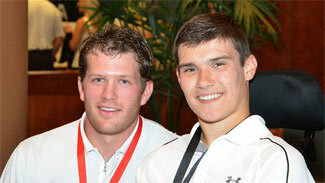 Ryan Suter was just one of the players who supported Jack Jablonski by attending Thursday's BEL13VE in Miracles Gala. "It was a celebration and promotion of the State of Hockey and how 'hockey sticks together' to take care of its own," read a statement on Jablonski's website, www.jabby13.com. "Participants at the event supported Jack and spinal cord injury care and a cure." Players and fans have been inspired by Jablonski's recovery since the accident on Dec. 30 during a junior-varsity game between Benilde-St. Margaret's School and Wayzata High School in Minnesota. Jablonski has regained slight movement in his limbs. "He's actually moved his legs a little bit on his own. Just the other day they had him doing push-ups," Jablonski's mother, Leslie, said before the event. "This stuff is unheard of. He wasn't supposed to move his arms. His legs, forget it." The evening started with the silent auction before moving on to a dinner and ceremony staged on the ice at Xcel. In the hours following the event, the Twittersphere was flooded with comments. "First-class event for a first-class man," tweeted Hershey Bears player Ryan Potulny. "One of the coolest experiences I have ever been a part of," tweeted USHL player and Nanne's grandson, Vinni Lettieri. "I'm at one of the coolest Minnesota hockey events ever," tweeted former NHL player Tom Chorske. But the tweet of the night came from Jablonski, who wrote, "Tonight is a night to remember." Judging by the progress he has made and the people he has inspired, it could be the first of many nights to remember for Jack Jablonski.